CRM Provides The Cornerstone Of A Great Customer Experience. The only source of competitive advantage is an obsession with understanding, delighting, connecting with, and serving customers. CRM is crucial to this success, but can only be successful if the foundations for sales, marketing, and service processes and technology are solid. The CRM Vendor Landscape Is Bloated, So Understand Core Focus Areas The landscape of CRM solutions has matured and converged as a result of merger and acquisition activities. These vendors offer solutions replete with features and functions. Every vendor can just about tick every box. CRM leaders must understand the core focus areas and value proposition of each vendor to make the right buying choices. Different Leaders Have Specific Strengths Salesforce, SAP CRM, and Oracle Siebel battle for the lead, with Microsoft and Pegasystems hot on their heels due to their breadth of capabilities and mature business practices. 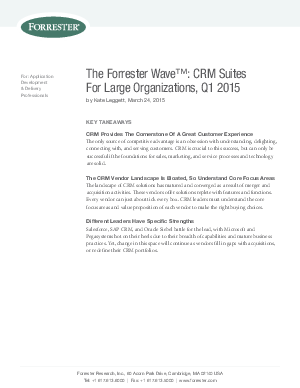 Yet, change in this space will continue as vendors fill in gaps with acquisitions, or redefine their CRM portfolios.